Who shone at the Premiership 7s? The highly-talented Calum Waters is determined to contribute to the new era which is beginning at Harlequins. After a tough season last year which saw Quins finish in 10th place, they began this term with a semi-final appearance at the Premiership 7s with Waters lighting up the competition. The scrum-half, who has made just four senior appearances for the Twickenham club, was outstanding in Northampton on both Friday and Saturday; scoring 10 tries and he was also awarded Player of the Tournament. “It was great, but it would’ve been nice to go a bit further as a team,” he said. “To get to the semi-finals wasn’t disappointing because we hadn’t trained with each other before, but we would have liked to win the trophy! “We set some goals at the beginning of the weekend and that was to learn and have fun as well as obviously winning. We did really well and learnt a lot from the weekend. “The experience of the weekend has been great because we have been very clear on our approach. We want to be challenging this year. Second best won’t really do. “On a personal level, it was very pleasing to perform well and show everyone what I am capable of. The 19-year-old was one of many young players who was able to showcase their talents at Franklin’s Gardens in front of the BT Sport cameras. For Waters, the Premiership 7s was another stage in his development to add to his experiences in the National Leagues with Worthing Raiders as well as Championship side Ealing Trailfinders. “I loved my time at Worthing,” he added. “I played at Ealing for a bit too and both are great clubs. It really helped me. It is a great introduction to men’s rugby and the physicality in some of those leagues is pretty ugly! 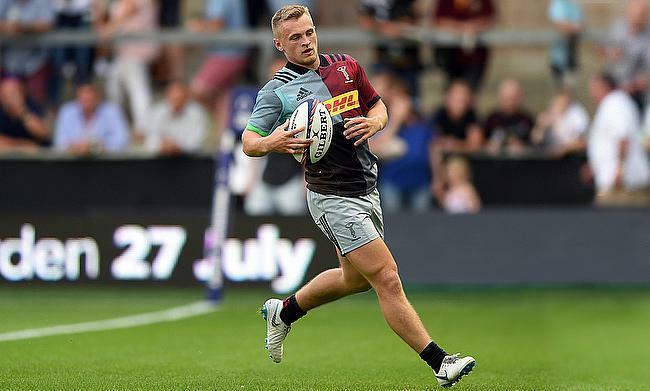 The scrum-half is hoping more opportunities come his way this term as Quins begin life under Paul Gustard after parting ways with Director of Rugby John Kingston at the end of last season. Quins finished in their lowest league position since gaining promotion into the Premiership back in 2006, but Waters admits Gustard has had a very positive influence on the club so far. ?? We put a mic on Head of Rugby Paul Gustard. “It has been amazing,” Waters said. “Pre-season has been hard and tough, but it has been great because we’ve bought into what we are doing so well. “We know when we are working really hard as a unit, it brings you tighter together off the pitch as well as on it. Quins have pre-season fixtures against Jersey Reds, Glasgow Warriors and Ealing to come in August before Gustard’s first major assignment comes against Sale Sharks at the Stoop on the opening weekend of the new season. Waters believes their performance at the Premiership 7s will certainly give Quins a good platform to work from heading into next month and the former Brighton College student is hoping his recent displays haven’t gone unnoticed. He added: “One of the big things I was looking into over the weekend was our start to the season. Sale is our first Premiership game and we had them in the group in the Premiership 7s so it was nice to have a hit out at them and put one over on them early doors! “It is something we can build on. It would have been great to bring some silverware home, but it is a starting block for us.